There is a real commitment and appetite to drive growth across the North to help rebalance the economy. The northern powerhouse concept launched by government in 2014 is at the forefront of this, and is helping to map out and accelerate that ambition – presenting the strengths, opportunity and potential of the northern regions on a global stage. Rather than working separately, and at times competing against each other, the regions that make up the northern powerhouse can join forces and focus attention and investment into the whole of the North. But it needs to be more than just an ambition. The UK economy as a whole is predicted to contract over the next three years. The impact of this is exacerbated in the North as we are failing to catch up. It is imperative that we seize the opportunity and showcase tangible examples of the northern powerhouse in action. This report aims to do just that. In the North we have a lot to be proud of, with over 1 million businesses employing over 5 million people. We have centres of excellence within this: a strong manufacturing sector, which accounts for over a quarter of the UK’s total manufacturing output; a thriving pharmaceutical sector, which accounts for nearly half of all medicinal exports in the UK; and a booming tech sector, with seven of the UK’s 27 key tech clusters located in the North, including the largest tech cluster outside of London, in Manchester. We also have natural resources that will lie at the heart of a decarbonised energy system, and a world-class higher education system. This report centres on a number of case studies, drawn from across the north of England and across these sectors. It looks at the wider policy initiatives that are helping turn the northern powerhouse into reality, and where further work is required. Key lessons include the following. Collaboration at a local level is needed to maximise central government investment. There is significant central government investment taking place across the North, which has now been further strengthened by the prime minister’s industrial strategy approach. The northern powerhouse effect will only come about, however, if business then capitalises on this investment, which a number of companies featured in this report have done. Close alignment is needed on skills to maximise central investment in local industries. A key finding of this report is that the northern powerhouse concept is helping to make it easier to recruit and retain talent by creating opportunities for people in North. The business community needs to take this a step further. By creating industry clusters, for instance, the case studies in the report have been able to work more efficiently with local authorities and align skills needs in that area with the needs of strategic sectors. This has driven innovation and developed far more integrated supply chains in the region. The North needs a role on the global stage. Underpinning all of this is the need to continue to push the northern powerhouse concept on the global stage. We have a strong story to tell as to why the North is a great destination, not just for business but for every aspect of it that supports a thriving business community, such as quality of life, culture and the lower cost of living. A common thread running through the case studies presented in this report is that success comes as part of a package, not just one initiative. There will be many opportunities ahead to keep the North in the public eye. The devolution agenda will take on a whole new level of momentum when the metro mayors are appointed in May. Manchester, Liverpool and Tees Valley in particular will come under the spotlight. I look forward with interest to the policies and changes that will come about as a result of their appointment. Having a close relationship with the local business community will be an important facet of this. While there are many more examples that we would have liked to see included in this report, hopefully it will inspire you to look further into your own networks, business model and decision-making, to find ways to be an active part of the northern powerhouse and to boost the northern economy. The road to a rebalanced, more productive and prosperous Britain depends upon a thriving northern economy. Currently, despite possessing substantial economic strengths and assets, the North underperforms relative to the rest of England. In recent years, however, there has been a determined effort to close this gap through the government’s northern powerhouse agenda. In spite of this central policy initiative, many people struggle to find substance behind the rhetoric of the northern powerhouse – indeed, few can point to clear examples of the northern powerhouse in action. Addressing this gap in understanding will help us better address the challenges and opportunities facing the northern economy and help it unlock its full potential. 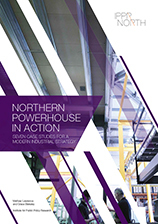 The purpose of this report is therefore to showcase the northern powerhouse in action, presenting case studies from across the north of England that highlight both the economy as it exists today, and what it can become in future. The northern powerhouse is not a government programme or piece of legislation: it is the potential that lies in a £300 billion regional economy competing on a global stage, powered by 15 million people and over a million businesses. However, realising this potential involves a recognition that the North could do better – it currently underperforms in key measures of productivity, employment, innovation and skills, both relative to much of the UK and, more crucially, to similar regions overseas. The goal of the northern powerhouse is therefore to ensure that the North closes the prosperity gap and realises its full potential. Underlying the broad notion of a northern powerhouse are four key ideas. The UK economy is unbalanced and over-reliant on London. The combined economic weight of the northern cities can provide a key counterweight, helping rebalance the economy and improve the UK’s weak productivity, investment and trade performance. The agglomeration effects provided by the biggest cities are key to driving economic growth in the North, in combination with maximising and expanding its existing economic assets in science, technology, finance and other innovation clusters. To achieve the required economic mass and to maximise agglomeration effects, it is vital that connectivity both within and between the cities of the North are improved. This will require significant investment in the infrastructure of the North, particularly around transport, logistics and connectivity. Unlocking the potential of the northern economy will be best achieved by devolving key powers and funds to city-regions, driven by visible and accountable leadership of directly elected metro mayors. With many of the key drivers of economic growth best organised at a mezzanine level of government – transport, innovation systems, inward investment – ensuring the right tier of government is in control of the right decisions is critical to ensuring balanced growth (Hunter and Cox 2015). Each of these ideas is contestable to some degree, and there are clear risks from too narrow a focus on Manchester and the other core cities (Cox and Longlands 2016), but together these propositions provide a useful basis for a Northern industrial strategy. The combined gross value added (GVA) of the three regions of the North – the North East, North West, and Yorkshire and the Humber – was £304 billion, or 19.1 per cent of the UK economy as a whole, in 2014. This makes the northern economy larger than all of the devolved nations’ economies combined. Indeed, if it were a country, the North would be the eighth-largest economy in the European Union (Cox and Longlands 2016). The North is also home to a thriving network of businesses. In 2014, more than 1 million northern businesses employed 5 million people, achieved £556 billion in turnover, and generated £111 billion in gross operating surplus (Cox and Raikes 2015). The North East is the only English region that exported more than it imported in 2014. The North is also home to a world-class higher education network, natural resources that will lie at the heart of a decarbonised energy system, and a dense logistical network. digital: according to Tech UK, the North is home to seven of the UK’s 27 key tech clusters, including the largest tech cluster outside of London, in Manchester (HMT 2016a). Despite its significant strengths, there is an entrenched ‘North performance’ gap (see figure 2.1). Since the 2008/09 recession, growth of GVA per capita in the North has been falling behind that of the rest of the UK, and is now 25 per cent lower than the national average and 15 per cent lower when excluding London (GMCA 2016). Employment rates also remain below the national average, with the working-age employment rate standing at 71.3 per cent, compared to 73.5 per cent nationally (ONS 2015). Underpinning the productivity gap is a series of performance gaps between the North and the rest of the economy. Enterprise: the ‘enterprise gap’ (measured by business starts per capita) is wide and persistent (Cox et al 2016). Skills: the northern economy has a higher share of people with lower skills, and a lower share of people with higher skills relative to the rest of the economy – 10 per cent of the working-age population has no qualifications in the northern powerhouse, nearly double the proportion in the South (HMT 2016a). Innovation and technology: measured by patents per worker and R&D spend, there has been a persistent ‘technology gap’ across the North as a whole relative to the rest of the economy (ibid). Investment: investment spending, such as on science, technology and infrastructure, is considerably lower in the North than in other regions of the UK (a gap that has worsened since the financial crisis) – infrastructure funding in the region is six times less than in London (IPPR North 2016). Connectivity and transport: the evidence suggests there is a strong link between agglomeration economies and connectivity and the North’s fragmented transport networking is lowering its productivity and growth performance. Reducing travel times between cities massively increases business access to a vast pool of labour – for example, the CBI estimates that ‘for every 1 million increase in the population that are within 60 minutes of travel time of a postcode area, this corresponds to an additional £0.50 in GVA per hour’ (CBI 2016). The performance gap between the North and the rest of the economy is greater than between comparable geographies in most other developed economies (see figure 2.2). The gap in labour productivity between the UK’s two largest city economies, London and Manchester, is larger than in any other G7 country and is more than double the gap between the two largest city economies in both Germany and Japan (OECD 2013). As a result, the North is underperforming relative to comparable economic regions around the world, with lower growth over the last 10 years than all but one EU country (Cox and Raikes 2015). Compounding this has been the uneven recovery: apart from London and the South East, in no other region of the UK has GDP per head recovered to its pre-crisis peak (Jacobs et al 2016). IPPR North analysis suggests that if the gap between the overall level of output per head in the North relative to the national level was halved, it would provide an economic boost of £34 billion, or 11.9 per cent, on current levels (Cox and Raikes 2015). Over the longer term, if the North can achieve transformations in connectivity, investment, skills and infrastructure, it is estimated that GVA could be some 15 per cent (or £97 billion in 2015 prices) higher than a ‘business as usual’ projection, and productivity some 4 per cent higher (TfN 2016a). The regional disparities in the UK are creating persistent lags on overall GDP and productivity growth. GVA and productivity growth in the North means a better economic outlook for the whole country. Improving the economic outlook for the North is therefore not only a matter of fairness – it will be important for policymakers to remember that northern prosperity is national prosperity. The result of the EU referendum was in part driven by a sense of regional imbalance and economic inequality within the country (Goodwin and Heath 2016). Given this, it is perhaps unsurprising that the North voted decisively for Brexit: 54 per cent of voters in the North West and 58 per cent of those in both the North East and Yorkshire and the Humber voted ‘Leave’. This outcome has pushed the question of economic rebalancing to the top of the policy agenda. Brexit will nonetheless create risks and opportunities that will vary by sector and location in the north of England (Cox and Dickinson 2016). To safeguard and grow its potential, the northern powerhouse will require specific tools and powers to exploit the opportunities that Brexit offers, and to mitigate the risks that it poses. Further devolution of powers and funding, combined with a place-based industrial strategy from government that is sensitive to location and rooted in an analysis of the North’s strengths and assets, will be critical to ensuring the North thrives when the process of leaving is complete. A place-based industrial strategy should be bold if it is to make the most of Brexit and drive economic growth in the regions. This should include stronger borrowing, taxation and investment powers for local authorities, devolved management of immigration and skills systems, and heightened powers to increase local and regional connectivity. There is no reason why the North should not weather the potential shocks arising from the vote to leave the EU and take advantage of the many opportunities it brings; an emerging place-based industrial strategy, the revival of the northern powerhouse agenda, and the imperative of regional rebalancing all point towards a thriving future for the North’s economy (Cox et al 2016). This report sets out to demonstrate that, despite the significant challenges facing it, the northern powerhouse already has the seeds of a flourishing 21st-century economy, and now needs a coherent industrial strategy to help it grow. This will require a better understanding of what kind of economy the northern powerhouse is and the kind of economy that it has the potential to become. provide lessons from each of the case studies that help to shape an emerging 21st-century industrial strategy for the north of England’s economy. The case studies we have chosen correspond to the four ‘prime’ and three ‘enabling’ capabilities of the northern economy set out in the recent Transport for the North-commissioned Northern Independent Economic Review (NIER). Taken together, the seven capabilities account for 2.1 million jobs in the region and just over £100 billion in GVA, representing around 30 per cent of all jobs in the North and just over 35 per cent of GVA. digital capability – including high-performance computing, cognitive computing, software tools/design and content, data analytics (‘big data’), computer simulation, and wider strengths in media. education (primarily higher education) – ‘offers research capability and technical expertise that underpins the “Prime” capabilities, provides access to global networks, and also provides a supply of skilled labour and export strengths in its own right’ (ibid). For each capability, we have chosen a case study that has national or potentially global significance in terms of the goods, services and technologies being developed and sold. Each case study is scalable, with a potential for significant growth in either employment or GVA for the northern economy, and a pan-northern reach, with demonstrable economic or research links across the North. exemplify the northern powerhouse in action. The manufacturing sector supports around 2 million jobs in the UK (around 8 per cent of total jobs), and the sector makes up 10 per cent of total UK GDP. Advanced manufacturing contributes £58,000 GVA per employee, and there are 108,000 companies in the sector with a combined workforce of 1.41 million and £263 billion total turnover. Areas of particular importance include the aerospace and automotive industries; the UK has the second-largest aerospace industry in the world, and some of the most productive automotive plants in Europe (BIS 2012). Advanced manufacturing has a strong presence across the North, particularly in relation to materials and processes – from automotive production in the North East, to aerospace in Lancashire, and graphene and 2-D materials in Greater Manchester. In Greater Manchester, for example, advanced manufacturing supports 51,600 people (4.5 per cent of total employment) in 3,200 businesses and generates £2.4 billion in GVA, as well as 80,000 jobs in Sheffield comprising 11 per cent of employment and 14 per cent of GVA (New Economy 2013). Liverpool has built much of its recent growth on advanced manufacturing, with 3,000 businesses in the sector supporting 50,000 jobs and yielding the city-region £3.4 billion in GVA each year (LLEP 2016). The city and its hinterland have led the way in developing new industrial techniques such as ‘lightweighting’, which uses materials such as carbon fibre and aluminium foam to reduce the weight of cars and improve fuel efficiency. At the forefront of lightweighting is Runcorn-based company Sigmatex which weaves carbon fibre and other industrial textiles for Formula One cars, hockey sticks, spaceships and military vehicles. At its inception in 1986, the company operated from a small factory based in Knutsford, Cheshire; Sigmatex now has a global presence, with five manufacturing sites across the US, UK and China, and 250 employees across the group. In 2001, after the first ever carbon-converting weaving machine (Max 3 machine) had been commissioned, Sigmatex began producing multiaxial carbon fabrics (very flat, non-crimp fabrics that allow for enhanced mechanical performance), which allowed the company to start supplying the marine sector, and offer new solutions to traditional industries. Today, Sigmatex converts huge quantities of carbon fibre each day, and it is sold on to a wide range of sectors – from sports to construction to defence. Sigmatex says that it is broadly supportive of the government’s northern powerhouse agenda, stating that anything that ‘[raises] the profile of manufacturing in the region’ is to be welcomed. Sigmatex also pointed out that the northern powerhouse agenda has helped to improve the company’s ability to recruit and retain people in the region with good engineering skills. The company was also positive about the government’s proposed industrial strategy, with the proviso that the agenda should help to ‘facilitate economic growth by encouraging more companies to locate in the region’ and, critically, stimulate both public and private investment. Sigmatex employs 250 people across the group. Sigmatex has a global presence, with five manufacturing sites across the US, UK and China. Sigmatex weaves carbon fibre and other industrial textiles selling to a wide range of sectors, from sports to construction to defence. has acted as a champion of the sector in the region, working successfully with a range of stakeholders – from the private businesses at the centre of the industry, to the universities that produce the intellectual and human capital on which it thrives. The Advanced Manufacturing Supply Chain Initiative (AMSCI), focused on the West Midlands and Liverpool city-region, also promoted the sector’s growth by supporting the development of automotive and aerospace supply chains (of which the lightweighting industry is a key component). Potentially world-leading technology with significant and varied commercialisation potential. Complements the government’s decarbonisation agenda by improving energy efficiency across various sectors (automotive and aerospace, for example). Highly integrated supply chains, which means that businesses support one another and the regional economy. Reinforces supply chains for other sectors (automotive and aerospace, for example). Advanced manufacturing is a strategic industry that is likely to be the focus of government’s industrial strategy and decarbonisation agenda. Brexit – heavily dependent on exporting to the EU. Skills – advanced manufacturing relies heavily on specialised skills for its growth, and these continue to be lacking in the North. Demonstrates the importance of close working between the public and private sectors, particularly through LEPs. A much greater emphasis will need to be placed on skills, with businesses working with local authorities to align local areas’ skills profiles with the needs of strategic sectors. A supportive national policy environment is also critical – AMSCI and the HVM Catapult have had a strong positive impact on the sector across the UK, and particularly in the North. Health innovation is a leading industry for the UK, employing over 165,000 people in 4,500 companies, generating over £50 billion in turnover each year. The pharmaceuticals and life sciences industries in the UK are among the largest in the world; one-eighth of the world’s most popular prescription medicine is produced in the UK. A recent report by IPPR North found that health science accounts for £17.5 billion of the North’s £304 billion output (in terms of GVA), and is forecast to grow by 44.6 per cent by 2030 (Raikes 2016). In total, 570,000 people are employed in health sciences across the North – 7.5 per cent of the region’s workforce – with 48,000 supported in the private sector and its supply chain. There are over 1,000 life and health science businesses in the North, and 97 per cent of them are SMEs; this strong supply chain has played a large role in attracting inward investment into the sector, such as the £550 million 10-year investment from AstraZenica in Cheshire. The North East is a highly attractive destination for life sciences and healthcare businesses, providing 38,000 jobs and helping to support a healthcare sector that is worth over £15 billion to the North’s economy each year, and contributes 33 per cent of the UK’s pharmaceutical GDP. QuantuMDx was founded in March 2008, with the vision of democratising healthcare by placing a laboratory-standard health device in the palm of a health worker’s hand, allowing them to provide their patients with a diagnostic result very cheaply and almost instantaneously. It is a rapidly growing SME based in Newcastle, and in the past year it has grown from 30 to 67 employees. The firm is currently developing Q-POC, a new miniature ‘handheld laboratory’, which is capable of taking samples from patients and diagnosing potential issues within 15 minutes. The company moved to Newcastle’s International Centre for Life in 2011 with six people, and has blossomed in the region: it now has its own dedicated HQ, bespoke laboratories and engineering complex in Newcastle’s Quayside area. QuantuMDx stated that ‘Newcastle’s mix of industry, universities, talent pool and scientific facilities’ make it a strategic location for the firm to headquarter its operations. The company also commented upon Newcastle’s low cost of living, high quality of life and excellent internal and external transport links. Investment is still difficult to come by, especially because there is continued ‘stigma’ attached to companies headquartered in the North. As such, QuantuMDx welcomed the government’s northern powerhouse initiative, saying ‘any initiative that can continue the trend to destigmatise the North is welcome’. There is some concern that the agenda is focusing on Manchester and Leeds and the surrounding areas, but overall QuantuMDx was encouraged by the recent increase in activity to ‘raise awareness of the northern powerhouse agenda in the North East’. QuantuMDx is developing a new miniature ‘handheld laboratory’, capable of taking samples from patients and diagnosing potential issues within 15 minutes. – worked closely with partners in the NHS, regional universities and private businesses to act as a champion for the sector, setting a strategic direction for health innovation in the North East and advocating for a supportive policy environment. – the council also plans to build a 4,200 sq ft ‘bio-incubator’ combined with ‘grow-on facility’ in the Science Central site it has supported in recent years. – research funding, in particular, is concentrated in the ‘golden triangle’, and this situation is likely to be exacerbated by Brexit as a great deal of research funding enters the UK via the EU. • The sector in the North supports growth and drives efficiencies in a number of other strategic industries (healthcare provision, for example). • The sector is diverse and therefore resilient, with a large number of innovative SMEs working in a variety of areas. • Can yield positive externalities (in the form of health outcomes) to the health economy. • Demographic change will increase demand. • Plentiful opportunities for partnership with world-leading research institutions. • Likely to receive continued support from government given its strategic importance. • As for many of the other sectors in the North, Brexit will be a key challenge – the sector is heavily reliant on funding from and exporting to the EU. • Real-term cuts to NHS and social care budgets are severely impacting the sector. • Clearly demonstrates the importance of skills. • Universities are clearly a critical part of the business infrastructure in the North. • Demonstrates the importance of improving the North’s image and reducing stigma. The UK energy industry supports 619,000 jobs nationally, paying £6 billion in tax, and investing £15.1 billion in UK infrastructure (Cox et al 2016). Much of this economic activity, though by no means all of it, is focused in the renewables sector. The government is aiming to produce 30 per cent of the UK’s energy through renewable sources by 2020, as well as reducing greenhouse gas emissions by 80 per cent to 2050. While the majority of the North’s energy is currently non-renewable, the North is nonetheless a national leader in the renewable sector, producing almost half of all renewable energy in the UK. Around half (48.2 per cent) of all the renewable energy generated in England, and a third (31 per cent) of that in the UK, is produced in the north of England. Analysis by IPPR North of employment in the low-carbon sector found that in 2013 there was an average of 22 jobs in the sector per 1,000 employees in the North (136,000 in reality), compared with an England average of 17 (ibid). DONG Energy is currently in the process of constructing a 1.2GW offshore wind farm 120km off the Yorkshire coast, called Hornsea Project One. It will produce enough electricity to power well over 1 million homes once it is operational in 2020. The developer has invested around £6 billion in the UK since 2004 and has been working extensively in the Grimsby area for some time now. The company will invest a further £6 billion in the Humber region by 2020, which is expected to create an average of 1,600 jobs during the construction of these projects and up to 500 jobs in operations and maintenance from 2020 onwards (Regeneris 2015). DONG Energy recently announced a multi-million-pound investment to create the world’s largest operational and maintenance hub in Grimsby – a clear example of its commitment to drive investment and economic growth in the area. Subject to planning approval, the new facility will be developed alongside the current operations and maintenance base at the town’s Royal Dock and will initially support the Westermost Rough, Race Bank and Hornsea Project One offshore wind farms. DONG Energy wants Hornsea Project One to facilitate the growth of UK supply chains in the offshore wind sector by linking industry and businesses together, and to develop Grimsby as a ‘hub’ for clean energy. The firm has helped to drive investment in other parts of the Humber area with Siemens opening their £310 million state-of-the-art blade factory in Hull, and the first blades being produced for DONG Energy’s Race Bank project. Hornsea Project Two was granted consent by the energy secretary on 16 August 2016. Hornsea Project Two will consist of up to 300 turbines and is located approximately 89km off the Yorkshire coast. When complete, it will generate 2.4GW of electricity, enough to meet the electricity needs of up to 1.6 million homes per year. Hornsea Project One will produce enough electricity to power well over 1 million homes once it is operational in 2020. DONG Energy has invested around £6 billion in the UK since 2004, and will invest a further £6 billion in the Humber region by 2020. – the LEP has also provided concrete support in the form of the Humber LEP Business Loan Fund, and various other forms of assistance to businesses thinking of locating in the area. • DONG Energy’s UK chairman says that the firm is fully ‘committed to investing in the UK’, and that creating jobs across the firm supports the UK’s industrial strategy. – this aims to highlight employment and supply chain opportunities associated with the construction, operation and maintenance of the Hornsea project. • Supports the government’s decarbonisation agenda and broader aims for industrial strategy. • Yields large positive externalities for the environment. • Large, resilient industry benefiting from economies of scale and high investment. • Government focus on decarbonisation represents opportunities for the sector, as does its focus on a green industrial strategy. • The ongoing consolidation of sector presents an opportunity for the North to operate at scale, with a consolidated competitive weight that can compete overseas. • As with each of the sectors, Brexit is a challenge, especially given the high levels of integration between UK and EU energy supplies. • Low oil prices combined with the removal of subsidies has also reduced the competitiveness of the renewable energy sector. • Skills shortages are also having a critical impact on the sector, which relies on high-level, specialised skills for its growth. • Industrial strategy should support industries, like renewable energy, that yield positive externalities for the economy more broadly. • Industrial strategy will need to be highly integrated with skills policy to ensure the industry has access to the human capital it needs to grow. • The industry is also reliant on the state of infrastructure around the country, so improving the UK’s infrastructure will be an important part of supporting the sector. The North is a digital powerhouse. Home to seven of the UK’s 27 key tech clusters – including the largest tech cluster outside of London, in Manchester – the North’s digital and tech sector produces £9.9 billion of GVA, and employs 283,500 tech workers, who represent 1 in 20 of the region’s workforce. Productivity grew four times faster compared to non-digital sectors, and digital workers are 53 per cent more productive than non-digital workers. Finally, digital workers in the North are paid on average 60 per cent more than non-digital workers (RSA 2016). The north of England’s digital sector is based on a series of major strengths in computer engineering, programming, data analytics, software development, and the technologies of the ‘internet of things’. Manchester is the largest tech cluster by employment outside of London with an average company turnover growth that is among the highest in the UK (Tech City UK 2015). The sector is expected to grow significantly in the coming years. Forecasts suggest that the digital economy in the northern powerhouse will grow by 20 per cent each year between 2015 and 2020, versus only 5 per cent per annum in London, while digital jobs will more than double in that period, from 284,000 to 622,000. Moreover, the RSA suggests that a ‘fully charged’ digital northern powerhouse would add £5.7 billion in GVA to the region (RSA 2016). Nonetheless, key challenges remain in equipping the North’s digital economy for the future. Bridging the digital divide in terms of infrastructure, particularly superfast broadband coverage, is critical to the sector. Indeed, the Department for Culture, Media and Sport has found that the rollout and better use of faster broadband by businesses will lead to a net annual GVA impact of about £17 billion by 2024, mainly through improving productivity (SQW 2013). Leeds has particular strengths in health tech, game design, and fintech. It is the second largest digital cluster in the North, after Manchester, employing 45,000 people (Tech City UK 2015). This is divided between major corporations – such as Rockstar Games (a leading computer game developer), Asda, Sky and William Hill, which have their digital operations in the city – and a rapidly growing SME scene, containing more disruptive, innovative digital startups. The city is also home to the North’s internet exchange, IXLeeds, which is a key part of the digital infrastructure of the region, and the only internet exchange not based in London. Leeds has also developed a particular specialism in data analytics. The Leeds Institute for Data Analytics, the National Consumer Data Research Centre, and the Open Data Institute Node are all key parts of a thriving data cluster. Central to this is Data Mill North. Launched in 2014, it is a collaborative digital project whose aim is to develop the first platform in the country that brings together open data information from multiple sectors across the North, and assist people, businesses and civil society to use that data creatively to gain understanding and new service solutions. By bringing together 350 datasets from 43 organisations across the North on its platform, Data Mill North’s open datasets help improve transparency and public services, empower people to take better-informed decisions, foster innovation and growth, and help problem solving. Data Mill North grew out of the Leeds Data Mill, an open data portal founded and funded by Leeds city council in March 2014. The aim was to create a platform that encouraged and showcased the use of open data from the council and other external organisations to drive collaboration, innovation and engagement within the city. It was generally considered the biggest and best data portal in UK local government. Data Mill North has continued where Leeds Data Mill left off, and recently won the Open Data Institute’s Open Data Publisher of the Year award for the breadth of its datasets, the way in which it helped to build a community around data that engaged citizens, and helping to use data for innovative purposes, including apps, websites and new analytical tools. • Social Housing: Best Choice (developed by Tom Forth): an easy-to-use and interactive visualisation of social housing stock in Leeds by ward, allowing people to make better-informed decisions around bidding for council housing. In addition, the increased publication of data has enabled innovators outside the council to create a range of products which provide added value back to the authority and the wider city, including the following. • 3D Map of Leeds (developed by Parallel): provides a range of interactive 3D maps and datasets, allowing individuals, civic groups, business and local government to view a range of social indicators, from population densities, to fuel poverty, flood risk and housing quality. • Leeds city assets (ODI Leeds): bringing together data on job vacancies, employment events, and economic data, the app showcases the economic assets of Leeds in real time. • Pedestrian casualty map (developed by Student Data Labs): this product gives a detailed breakdown of pedestrian casualties from road accidents in Leeds between 2009 and 2015, helping support safer urban design. • ViaggiaArt (developed by Altrama): the Italian-developed app is an interactive tour guide of Leeds, helping visitors enjoy a more digital and tailored visit to the city. Data Mill North aims to become the best open data site in the UK. Tom Forth, an associate of the Open Data Institute Leeds and a collaborator with Data Mill North, stressed to us the importance of consolidation in data portals, as they are expensive and over-replication is a distraction. He welcomed the recent consolidation of datasets under Data Mill North as a key step towards expansion, which highlights the importance of pan-northern collaboration, such as the partnership between Things Manchester – the node of the international Things Network – which will help provide a free and open crowd-created network for the internet of things across the northern powerhouse’s cities, and help a new generation of data-driven businesses in the North. Data Mill North will be central to this wave of data-driven growth. The success of both Data Mill North and the wider data analytics sector, however, will ultimately depend on the success of the northern powerhouse agenda, from improved infrastructure and connectivity to an open, innovative tech culture. Beyond that, what is achievable is dependent on the ability of Data Mill North to incorporate standard formatting for data and metadata, to enable common outputs, investment in tools that can transform data from legacy systems to be easily usable, and an increase in automated publication and data harvesting reducing the need for manual interaction and processing. While these will be a challenge, if they can be overcome the potential of the sector is significant. A conversation during a ‘hack day’ held by ODI Leeds in conjunction with Highways England in October 2016 as part of the #HighwaysHack project. – it was generally considered the biggest and best data portal in UK local government. Ultimately the success of both Data Mill North and the wider data analytics sector will depend on the success of the northern powerhouse agenda, from improved infrastructure and connectivity to an open, innovative tech culture. • Significant scale and agglomeration effects underpinning high growth potential. • World-class firms and assets in fast-growing digital sectors, including the internet of things technologies, data analytics, digital advertising and gaming. • Culture, living costs and work spaces reinforcing a positive ecosystem for digital innovation. • Industrial strategy is likely to continue to support sector development. • Emerging digital-focused, North-based finance scene, such as Tech North’s co-investment fund, that can drive the growth of the sector. • Key sector for boosting growth, productivity and wages in the North. • Weak broader economic performance in the North is holding the sector back. • A talent squeeze – the digital economy is expected to need an additional 760,000 more digital workers by 2020, squeezing the talent pool and increasing competition for talent. • The digital infrastructure of the North, while competitive, lags behind London and the South East. • Potential uncertainty and lack of access to the single market after Brexit. • Infrastructure investment is critical – both hard (transport, especially intraregional connectivity and citywide networks) and soft (superfast broadband and well-located flexible workspaces) are vital. • Tailored approach to Brexit – without freedom of movement, a visa scheme for top European digital talent is likely to be vital to ensure the North’s digital labour force remains world leading. The North has 32 higher education providers, with over 520,000 students (28 per cent of England’s total). The N8 universities2 – the eight most research-intensive universities in the North – contribute £6.6 billion of GVA to the northern economy per year, attract £1.26 billion of research funding per year, and together delivered a total of 119,000 full-time equivalent jobs (Sheffield University 2016). Higher education in the North also generates significant export income via overseas students (TfN 2016a). However, higher education is not just a vital sector on its own, it is also a critical enabling capability for the northern economy, providing the region with significant research capacity, knowledge and innovation excellence, economic assets and facilities. The sector helps to generate the skilled workforce (if retained in the North) that should attract and retain employers and businesses, thereby contributing to the development of agglomeration effects both in key city regions as well as at a pan-northern level. More could be done to improve education outputs, with the North performing worse on qualification rates than much of the rest of the UK, particularly at higher levels (NVQ4 and above). Given the strong link between higher qualifications and strong productivity performance, innovation and higher earnings, closing this gap is vital to the future of the northern powerhouse. The University of Sunderland is a key higher education anchor institution in the North East. The university supports 5,400 jobs in the region, and generated £428 million GVA per for the region in 2015 and £195 million GVA for the city of Sunderland itself. Alongside numerous areas of research excellence, the university is a leader in broadening access to higher education, which is vital to reduce regional inequalities, improve life chances, and broaden the talent pool of the North East. The university’s ‘widening participation’ programme is officially the leading HEI for widening participation in the UK, and has received numerous awards for its efforts. The widening participation programme has helped to ensure that 30 per cent of young full-time undergraduate entrants in the past 15 years have been from low-participation neighbourhoods, while there are 50,000 graduates who the widening participation programme supported. An impressive 97.4 per cent of young, full-time undergraduate entrants are from state schools, and 45.7 per cent are from socioeconomic classes 4, 5, 6 and 7. Moreover, the university outperforms its location-adjusted benchmark in terms of widening access. The track record of success reflects continued investment. For example, between 2017 and 2019 the university is expected to spend £17.8 million on access, student success and progression initiatives. This is combined with a broad range of local and regional initiatives, for example ‘Primary to Uni’ (supports primary school students onto university); ‘Right Choice’ (supports KS4 students on GCSE choices) and ‘First Choice’ (prepares sixth-form students for higher education). Participants in the University of Sunderland’s ‘widening participation’ programme. Broadening access is a strong theme in the institution. Steve Heywood, assistant director of corporate communications and stakeholder engagement at the university, made clear that success in broadening access was a result of embedding that goal throughout the way Sunderland operates, from the strategic plan right down to classroom practice and student support; the evidence suggests it is genuinely ‘mainstreamed’ in everything the university does. As various conversations with figures at the university attested to, the success of the widening participation programme reflects at a micro level key themes of the broader success of the northern powerhouse: strategic collaboration between public and private institutions, investment in the people and talents of the North, and a clear and longsighted display of leadership led by northern institutions. – the access agreement forms a key part of the architecture driving the University of Sunderland’s widening participation programme, though it also goes further than required by OFFA. – the LEP is also committed to increasing levels of higher education participation among young people in the North East, working with universities and colleges across the region – this includes co-ordinating with universities such as Sunderland on outreach programmes, investing in skills and employability work provided by the universities in the region, and ‘new proposals to link undergraduates and graduates to North East industries in order to improve levels of graduate retention and employers’ ability to access skilled employees’ (NELEP 2015). • Research capacity, knowledge and innovation excellence, integrated into broader economic assets and facilities in the northern economy. • Excellent development of local workforce, with track record in broadening access to higher education. • World-class research excellence, enabling prime sectors in the North and across the UK to thrive by providing services to high-growth companies. • Supports the long-term strategic goal of changing underlying attitudes and aspirations when it comes to higher education access in the region. • Brexit – potential threats to staffing, funding, and research collaboration. • A more austere funding environment during further period of fiscal consolidation. • While the university has a highly impressive record on widening access, it acknowledged that it has a challenge in terms of its comparatively high levels of non-continuation – improving education outcomes across the North will be a key challenge moving forward. • Effectively planned collaboration with a long-term horizon between key public institutions and northern businesses is key to improving the supply of skilled workers to the northern powerhouse. • Improvements in education outcomes – key to closing the productivity gap among others – will require holistic intervention, from schools to university at different spatial levels, making subsidiarity crucial. The financial and professional services sector is a vital and growing enabling capability for the North’s economy. Alongside logistics and education, the sector enables the prime capabilities of the northern powerhouse to thrive by providing services to high-growth companies, underpinning the wider regional economy, and providing some small but significant and growing specialisms. The professional and business services (PBS) sector in the North is concentrated in Manchester and Leeds (accounting for almost half of all northern PBS employment), with the two cities increasingly complementary in their different strengths and acting as financial hubs for other parts of the North. The sector contributed £19.5 billion in GVA in 2013, equivalent to 6.8 per cent of total northern GVA, and employed 368,000 people, 5.1 per cent of all jobs in the region (TfN 2016a). IPPR North has found that parts of the North have a high concentration of financial and professional services economic activity that is growing above and beyond national or industry-wide trends (Raikes and Cox 2016). Greater Manchester also has a significant strength in the sector: it is specialised in a range of activities-related insurance, and legal and accounting activities, in which it has grown disproportionately. Cheshire and Warrington and Leeds city-region have also developed particular specialisms that continue to grow. Moreover, if London is excluded, just over a quarter (27.4 per cent) of non-London PBS employment is located in the North (32.1 per cent of financial and insurance and 30.7 per cent of legal and accounting), which suggests that the region is a specialised and competitive cluster in financial, insurance, legal and accounting activities. The Manchester city-region accounts for 7 per cent of all financial services output and 10 per cent of all employment in the UK. More than 60 banks have operations in Manchester, 40 of which are overseas-owned, making it the largest regional corporate finance and stockbroking centre in England. Moreover, strong future growth is forecast for the finance, real estate and business services sector; 60,000 more jobs in the industry are forecast by 2025 (HMT 2016b). In 2004, Manchester was chosen as the new location for BNY Mellon’s Global Delivery Centre. BNY Mellon is a leading asset management and securities services company, providing asset and wealth management, asset servicing, issuer services, clearing services and treasury services, operating in 34 countries with 42,000 employees worldwide. The first office opened in 2005, adding a second office in Spinningfields in 2008 as it became one of the core financial institutions anchoring the growing finance sector in Greater Manchester. The Manchester operation has grown both the scale and range of sophisticated services it provides, becoming one of the best-performing sites for the bank globally, with over 20 business departments represented. The bank described Manchester as one of its ‘three global growth centres’, with the office handling £15 billion worth of transactions across 80 global money markets every day (BNY Mellon 2015). The offices of BNY Mellon, among other firms, in Spinningfields – the epicentre of Manchester’s burgeoning finance sector. Photo © joegolby, via iStock. BNY Mellon has invested in developing the skills base of the Greater Manchester area, creating an advanced apprenticeship in investment administration, a new NVQ-level qualification developed in partnership with the Financial Services Skills Council, in which over 100 members of staff are participating. They have also partnered with Manchester Metropolitan University to develop a part-time financial services BA honours degree course, with almost a hundred staff enrolled. – There is uncertainty over the final settlement, but it is likely that whatever the terms of Brexit, it will have significant policy implications for the UK’s – and Manchester’s – financial services. • The UK’s global location between Asian and US markets, and the additional ‘soft’ advantages of the English language and a robust and independent legal system. • Professional institutions that retain high standards backed by high-quality universities. • Significant talent pools of skilled labour, with 50,000 graduates in the North West each year, two-thirds of whom typically remain in the region after graduating. • Enabling prime sectors in the North and across the UK to thrive by providing services to high-growth companies. • Employees are now tending to focus more on strategy and advice, rather than audit and analysis which is becoming fully automated – there is a significant opportunity to upskill and expand in these areas. • Improving the export performance of the North’s financial and professional business sector represents a key opportunity. • Brexit – potential economic contraction and loss of tariff-free trading with the EU, particularly the loss of passporting rights for financial services. • Questions surrounding continued government support post-Brexit for the sector. • Skills shortages in a key sector, with London dominating the talent market. • The spatial challenge – the wider economy and the North’s prime sectors rely on PBS to function, yet it is trending towards centralisation in Leeds and Manchester. • The North must have a clear voice in Brexit negotiations – there needs to be greater alignment in forming demands on a pan-regional level, perhaps co-ordinated by IPPR North’s suggested Northern Brexit Negotiating Committee, with the power to negotiate potential devolution of immigration policy. • Effective transport links, both at a pan-northern level but also to London and internationally, are key to the continued expansion of the sector – metro mayors will play a role in supporting this. • LEPs need to be involved in developing the skills its local financial and business services sector needs. The North’s well developed and increasingly sophisticated logistics network is a critical enabling sector through which the goods, services and products of the northern powerhouse are moved across the North, the UK and internationally. Transport for the North’s recent Northern Freight and Logistics Report argued ‘the North of England is a “super region” for freight that handles around a third of UK road, rail, distribution centre and port activity’ (TfN 2016b). It has a strong and growing multimodal freight capability. The North also provides 34 per cent of the UK’s large warehouse capacity and carries 56 per cent of total rail freight tonnage, while ports in the North handled 173.9 million tonnes of freight (import and export) in 2014, amounting to 34.5 per cent of all UK port traffic (Laybourn-Langton et al 2016). The North has an impressive multimodal freight capability that allows it to handle and distribute a large proportion of the UK’s freight traffic. Moreover, with the government committing £13 billion to expanding the transport network of the northern powerhouse over the course of this parliament, the logistics capacity of the North is growing. Expanded rail, road and waterborne freight capacity is expected to achieve £34.7 billion of user and non-user benefits to the UK economy, and £13–20 billion of wider economic benefits (GVA benefits) to the northern economy, as well as 25,000–38,000 additional jobs in the northern economy by 2033 (TfN 2016b). Amazon, the world’s largest online retailer, has recently committed to investing in a 260,000 square-foot warehouse at Manchester’s Airport City. Once fully operational, the site will be the leading hub for Amazon’s distribution across the North West, and is expected to be at the forefront of logistics infrastructure in the UK. The project is expected to bring 1,500 permanent jobs to the region directly across a wide range of occupational skills, from IT services to operation managers and warehouse operators. While the investment decision was rooted in wider strengths in the North West’s logistics sector, Amazon itself mentioned three core strengths of the location that guided the decision. First, the tailored and effective support that Greater Manchester combined authority (GMCA) was able to provide in terms of securing well-qualified employees. Second, the location sits at the heart of a wide and diverse pool of potential employees which, given the size of the operation, was critical. Manchester’s location – with up to 22 million customers within two hours, and well connected to the UK as a whole, which the warehouse serves – was cited as a major draw. Finally, the strengths of the local transport infrastructure combined with Manchester’s location as a nodal point within the region’s transport network was also cited. Nonetheless, a number of issues were raised. The paucity of connectivity is a potential barrier to expansion, with almost half of employees currently using Amazon-provided transport to reach work. Similarly, broader bottlenecks in the region’s transport infrastructure, particularly on the M6, were raised as areas of potential future concern. The new site at Airport City will be a pivotal distribution hub for Amazon, part of a growing logistical cluster in Manchester. Automating technologies are set to reshape how the logistics sector and other core capabilities of the northern powerhouse operate. • The North West provides excellent access to a significant local labour market, and a much larger pool of potential customers. • Lower operating costs (typically 30 to 40 per cent lower than in London). • Adequate space to both expand and to do so at cost-effective rate. • Proactive local government support. • The growth of the North’s transport networks will have a key knock-on effect in raising the efficiency of the logistics sector, providing significant opportunities for growth, particularly in opening up an east–west freight super corridor (Laybourn-Langton et al 2016). • The growth in online consumption is set to drive demand for logistics. • Brexit will impact the growth of the sector given its alignment with the EU market. • The transport network in the North is not strong enough to support long-term growth. • Increasing automation of sector presents potential risks in terms of declining employment in the future. • Decarbonising in an effective, efficient and timely manner will be a key challenge. • Expansion of infrastructure investment will be critical for the future of the sector – this can also have a strong multiplier effect in the North. • Amazon highlighted the critical role played by local government in supporting the project, so GMCA will play a critical role in creating a supportive business environment moving forward. • Public policy, planning and decision-making processes regarding pan-regional connectivity will need to be simplified and devolved. • Any industrial strategy should ensure that it is underpinned by the decarbonisation imperative – Transport for the North will be critical in driving and delivering this, in collaboration with new metro mayors. 1Photo opposite courtesy of ODILeeds ©. 2 The universities of Durham, Lancaster, Leeds, Liverpool, Manchester, Newcastle, Sheffield and York. A coherent and effective industrial strategy is a key mechanism for addressing the UK’s longstanding economic challenges, as well as the specific opportunities and threats of Brexit. With the newly created Department for Business, Energy and Industrial Strategy (BEIS), the government has signalled its renewed interest in such an approach at a national level. Importantly, it has been accompanied by a revival of the northern powerhouse agenda, with the recently published Northern Powerhouse Strategy underpinning a renewed commitment to boosting the North’s economy. IPPR’s current research has identified eight broad aims for any regional or national industrial strategy (Colebrook 2016). They can be set out as follows. Building up the manufacturing base. Ensuring co-ordinated public and private investment. Continuing the devolution of political and economic powers. Promoting both horizontal and vertical interventions. Improving these areas should be the goal of a regional, place-based industrial strategy. The remainder of this chapter focuses on the nature of a place-based approach and learning from our seven case studies. proximity – and place-based policies that support clustering – is critical to creating positive economic spillovers, especially for some of the North’s core capabilities such as digital and low carbon, where clustering has helped to drive innovation and retain a high-quality manufacturing base (Colebrook 2016). This does not mean there is not a strong role for national policymakers; however, in general, industrial policymakers should be given the powers and fiscal ability to determine their own regional priority sectors, and resources and powers should be devolved to the appropriate regional authority to enable them to shape and nurture their regional economies (Colebrook 2016). There are multiple forms that a more spatially focused industrial strategy could adopt. IPPR North believes that a place-based industrial strategy should be underpinned by the following three core principles (Cox et al 2016). Regional differentiation: develop a more sophisticated understanding of what drives growth in different types of region rather than the hitherto insufficient account of growth focused on urban agglomeration. Co-ordinated investment: drive up public investment in infrastructure, research and development and other economic assets to match private sector investment and act as a catalyst for business innovation and smart specialisation. Devolution: develop and enhance its approach to devolution both to regional and local tiers of government, with a much greater emphasis on fiscal powers to enable subnational bodies to direct investment towards local economic opportunities. any future regional industrial strategies should therefore leverage existing assets and capabilities of regions, building on their comparative advantage. the case studies presented in this report demonstrate the importance of the principle of local-led economic development strategies in practice – from Amazon and BNY Mellon highlighting the supportive role of GMCA, to the innovation of Leeds city council with Data Mill North, and the co-ordination between the University of Sunderland and local government. the corollary of this is ensuring that devolved regions or cities have the appropriate fiscal powers to drive investment. as a corollary, improving and expanding connected freight interchanges/distribution parks would improve the transport and logistics capacity of the North. at the same time, the role of metro mayors in driving strategic improvements in connectivity is likely to be key, reinforcing the need for devolving strong powers of transport investment, planning, and spatial strategies. the importance of quality, affordable housing, childcare and other key elements of social infrastructure were also stressed by our case studies. in many areas this is carried out through a strong relationship between the LEP and local or combined authorities. to ease pressures on skills due to likely restrictions on migration after Brexit, a place-based industrial strategy could consider devolving the management of immigration to regions, potentially led by metro mayors. devolution of training and skills powers will be required to adapt and respond to changing local labour market conditions. without freedom of movement, an equivalent visa scheme for top European digital talent is likely to be vital to ensure the North’s digital labour force remains world-leading. it is important, therefore, that there is greater co-ordination of who speaks for the North and a clear articulation of priorities for the seven major capabilities during negotiations. without a clear articulation and defence of the interests of the North’s economy, an emerging industrial strategy to rebalance the UK economy will face substantial headwinds. The concept of the northern powerhouse continues to get a mixed reaction, but its reality is simple: the combined talents, effort and enterprise of the people and businesses of the North have always and will always drive the success or failure of one of Europe’s most dynamic regional economies. In highlighting the northern powerhouse in action, with examples from across the seven sectors that are likely to drive high-quality, inclusive growth in the future, we have demonstrated its potential at the same time as setting out the challenges and opportunities facing regional and national policymakers. Challenges remain, but with a place-based industrial strategy coming to the fore, the North is once again demonstrating that northern prosperity is national prosperity.